The Minnesota State Fair in St. Paul is the biggest event in Minnesota, with around 1.7 million people attending every year over the 12 days of the fair. Parking at this kind of event is always a hassle, and it helps to know the possibilities before you find yourself in the traffic surrounding the fair, looking for a place to park your vehicle. Parking at the fair is available but is expensive, and the State Fair's parking lots can fill up quickly. There is parking for guests with disabilities in the fair's parking lots, but the fee is the same as for everyone else. Parking a motorcycle in the State Fair's lots also requires a fee. If you ride a bicycle to the fair, you can park free in three bike corrals at the Minnesota State Fair. All of the residential streets near the fairgrounds have parking restrictions during the State Fair to prevent fair visitors parking on the local streets. 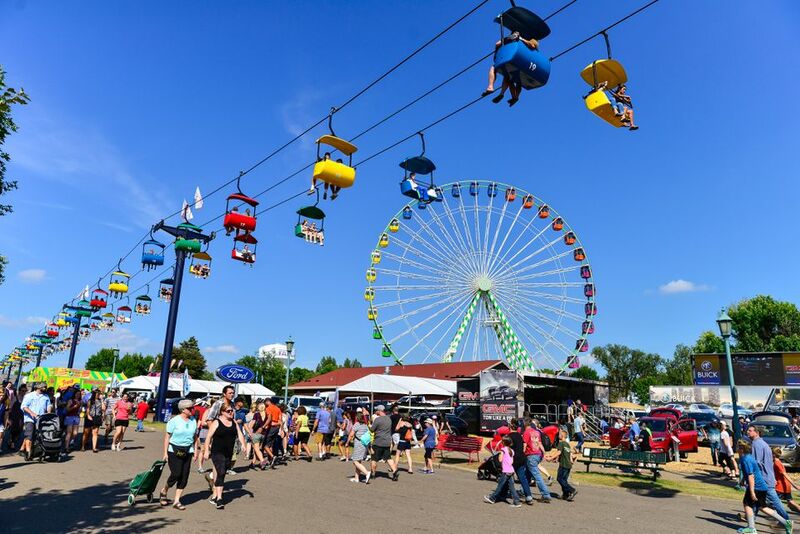 The City of St. Paul, the city of Falcon Heights, and the city of Roseville all put temporary parking restrictions in place during the fair, primarily to deter the congestion from State Fair visitors, so that residents and emergency vehicles can use the streets. If you want to find legal street parking for the Minnesota State Fair and avoid the State Fair parking restrictions, you'll have to park and walk about two miles from the nearest unrestricted free street parking. Head south or north of the Fairground; you'll find parking restrictions from Como Park to the east and the University of Minnesota St. Paul campus to the west. Entrepreneurial residents who live near the State Fair in St. Paul will let you park on their lawn or in their driveway for the right price. Look out for signs in neighborhoods immediately to the east of the Fairgrounds. Typical prices are $5 to $15, depending on how far it is to the Fairgrounds, but these can change yearly. There is one way you can park for free while you attend the Minnesota State Fair. There are several park-and-ride lots with free parking and regular free shuttle buses to the fair. Drive in, park your car for free, and ride the bus to the fair for free. There are more than 20 park-and-ride lots distributed around St. Paul and Roseville that are open every day of the Minnesota State Fair, plus another 10 park-and-ride lots that operate on the weekends and Labor Day. The lots can get busy, especially at peak times, but they are close together so it's usually easy to drive to another lot if your first choice is full. Another option is using one of the Express buses that run to the fair from locations around the Twin Cities and suburbs. These buses require a fare, but the bus is fast and air-conditioned. Another bus option is the regular city bus. Metro Transit operates a number of regular bus routes that serve the Minnesota State Fair, with stops right outside the main entrance to the fairgrounds. Regular fares apply to all passengers, but it's very affordable.